USDA Wildlife Services-APHIS will once again be conducting rabies programs in the Northeast United States. The ultimate goal is to push the disease right off the map - literally, by pushing the outbreak of rabies back until it reaches the shores of the Atlantic ocean. The continued rabies programs includes two primary modes in New England: an Oral Rabies Vaccine (ORV), and continued surveillance. 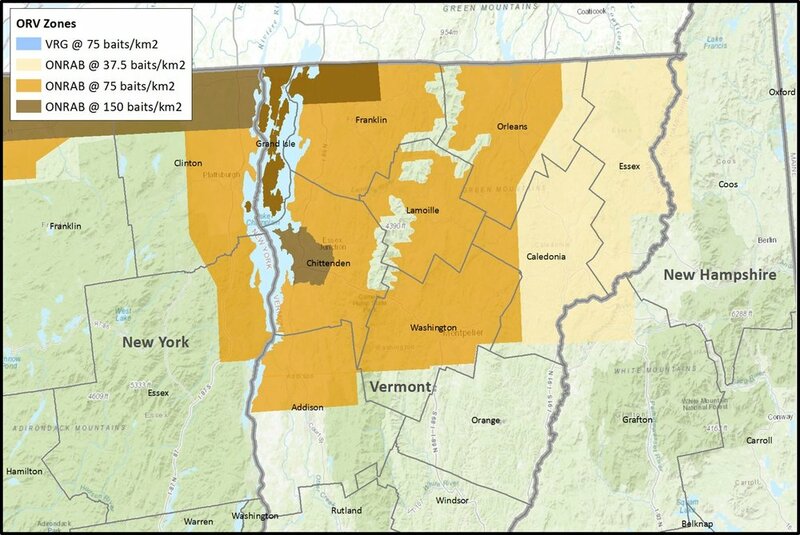 USDA’s Wildlife Services, with the assistance of state wildlife management agencies, began distributing ORV baits back in August across both rural and urban areas of New York, Vermont, New Hampshire, and Maine via airplane (fixed wing), helicopter and vehicle. The vaccine baits are coated with a fishmeal attractant and are packaged in either one-inch square cubes or two-inch plastic sachets. The agency has used vanilla-flavored packets in the past. Furbearer Conservation briefly reported on studies of bait flavor preferences in raccoons and skunks during our first installment of “The Great Debate on Trapping Bait”. Previous versions of the blister pack, containing the ONRAB® vaccine, were made attractive to wildlife by a sweet coating that included vegetable-based fats, wax, icing sugar, vegetable oil, artificial marshmallow flavor, and dark-green food-grade dye. The vaccine was successfully administered in Canada to vaccinate raccoons, skunks and foxes against rabies, where field crews distributed those ORV baits by plane or on the ground by hand. Citizens who come across a dropped bait pack should leave it untouched. The bait is not harmful to children or pets, but direct skin contact should be avoided. The RABORAL V-RG® vaccine is safe for more than 60 different species of animals, including domestic dogs and cats. 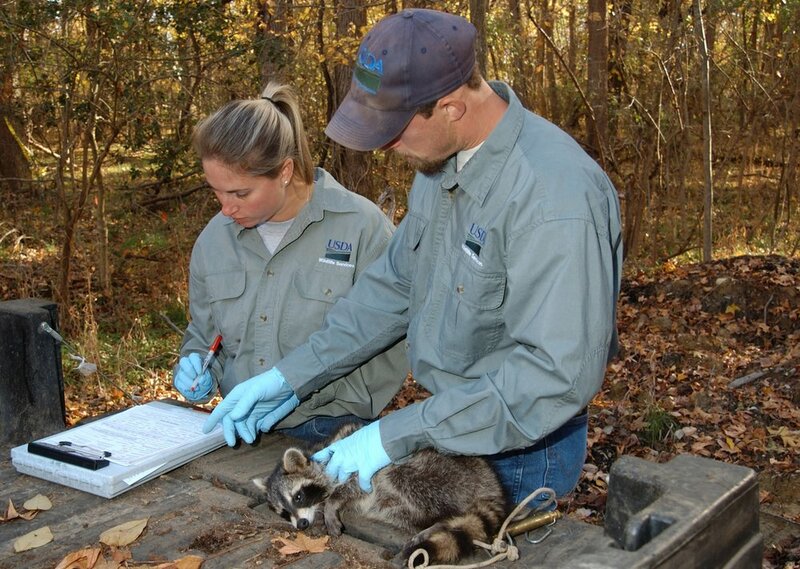 USDA’s National Rabies Management Program was established in 1997. The program has achieved admirable success; including the elimination of canine rabies in the U.S., the “near-elimination” of gray fox rabies in Texas, and reducing the spread of raccoon rabies from the Eastern United States into other areas. In order to fully evaluate the ongoing ORV program, an Enhanced Rabies Surveillance (ERS) zone has been implemented in New Hampshire to monitor ongoing rabies cases. The goal is to verify the presence or absence of raccoon variant rabies in the areas just outside the ORV drop zones. The ERS zone not only encompasses the current ORV zone but also extends into areas north, east and south. 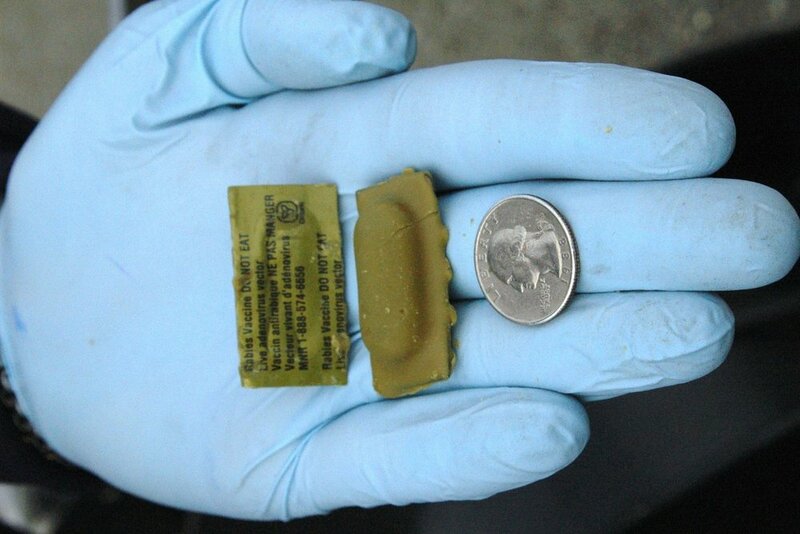 The continued surveillance includes the collecting of wildlife that would otherwise not be tested for rabies (hunted or trapped during legal season times). It would include wildlife of interest handled by wildlife rehabilitators, animal control agents, veterinarians, highway crews, police departments, and others. Enhanced Rabies Surveillance does not include collection of animals involved known to be involved in a human and/or pet rabies exposure situation. USDA has tasked staff with “surveillance” routes - cruising the state’s main roadways in search of roadkill carcasses for disease testing. However, roadkill specimens are not ideal for biological testing in many cases, which is why USDA’s Wildlife Services has also requested assistance from local hunters and trappers with the collection of samples for rabies testing. Staff are particularly interested in brain stem tissue from the carcasses of Raccoons, Skunks, Foxes, Coyotes, Fishers, Woodchucks, and Bobcats. Any wildlife that is observed acting sick or unusual, and/or with lesions or large quantities of porcupine quills indicative of aggressive behavior are also of special interest. The regions of interest include New Hampshire towns and counties north of the Laconia / Lakes Region (see image). To facilitate rabies sample collection, freezer drop-off locations have been set up at NH Fish and Game’s Region 1 & 2 offices. Submitted carcasses will be picked up for testing by USDA staff regularly. For more information, please feel free to contact Colleen Marron or Carrie Stengel at the USDA Wildlife Services-APHIS Concord, NH office, at (603) 223-6832. Newer PostNew Hampshire Trappers: Turn in your tissue!